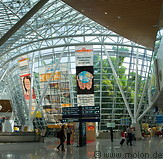 KL International Airport (IATA code: KUL) is Malaysia's main international airport and a major regional aviation hub. It lies near Sepang, about 50km south of Kuala Lumpur. It opened in 1998 and has by now replaced the old domestic airport in Subang. It is currently ranked as the 13th busiest airport in the world by international passenger traffic. KLIA is the hub of Malaysian Airlines and AirAsia.